For other uses, see Tokaj (disambiguation). Tokaj listen (help·info), is a historical town in Borsod-Abaúj-Zemplén county, Northern Hungary, 54 kilometers from county capital Miskolc. It is the centre of the Tokaj-Hegyalja wine district where Tokaji wine is produced. The wine-growing area was first mentioned by the name Tokaj in 1067. The town itself was first mentioned in documents in 1353. Its first castle was a motte, which was destroyed during the Mongol invasion of Hungary. By the 14th century the town already had a stone castle, belonging to the Diósgyőr estate. After 1450 Tokaj was the property of the Hunyadi family, so after Matthias Hunyadi became king, the town became a royal estate. In 1705 Francis II Rákóczi ordered the castle to be destroyed. 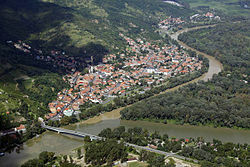 After the Austro-Hungarian Compromise of 1867 the town prospered, but when the world wars came, it suffered a lot, lost its importance and its town status. Even its role in wine trade was taken over by Sátoraljaújhely. Tokaj was granted town status again in 1986 and it started to prosper again. Now the town is a popular tourist attraction. Tokaj wine region is a historical wine region located in northeastern Hungary and southeastern Slovakia. 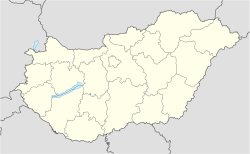 It is one of the seven larger wine regions of Hungary (Hungarian: Tokaji borrégió). Hegyalja means "foothills" in Hungarian, and this was the original name of the region. The region consists of 28 named villages and 11,149 hectares of classified vineyards, of which an estimated 5,500 are currently planted. Tokaj has been declared a World Heritage Site in 2002 under the name Tokaj Wine Region Historic Cultural Landscape. However, its fame long predated this distinction because it is the origin of Tokaji aszú wine, the world's oldest botrytized wine. Wikimedia Commons has media related to Tokaj, Hungary. This page was last edited on 15 February 2019, at 22:00 (UTC).